SINGAPORE, Jan. 28, 2019 /PRNewswire/ -- Live Nation Entertainment, the world's leading live entertainment company, today announced that it has acquired a controlling interest in ONE Production, one of the leading concert promoters in Singapore. 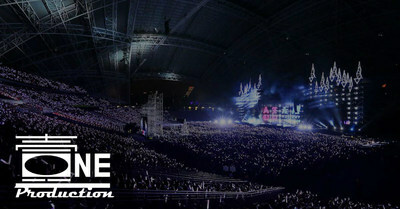 The majority of ONE Production shows feature artists from countries across Asia, which complement the North American and European artists Live Nation Singapore has already been bringing to the region. Asia continues to be a market of growth and opportunity for Live Nation, and the company has seen Singapore steadily raise its profile as a destination for tours spanning Western Pop and R&B genres as well as Korean Pop, Chinese Pop and more. In 2018 ONE Production promoted stadium and arena shows with the likes of Mayday, Eason Chan, Got7, Twice, Super Junior, EXO, and One OK Rock. 2018 was also the most successful year to date for Live Nation's existing business in Singapore, as they toured artists including Bruno Mars, Imagine Dragons, The Weeknd, Mariah Carey and Dua Lipa. "By joining forces with ONE Production, we are creating the leading international concert promotion business in Singapore," said Alan Ridgeway, Chairman, Live Nation Asia Pacific. "We look forward to amplifying performance opportunities for artists and diversifying concert offerings for fans by welcoming the local expertise of the ONE Production team." "Over the last few years, ONE Production has enjoyed tremendous success working with Taiwanese, Korean, Chinese, and Japanese artists," said Ngiam Kwang Hwa, Managing Director, ONE Production. "We already know the Live Nation team very well and are excited by all the opportunities this new venture generates for our team and our artists." ONE Production is a division of Rock Records Singapore Pte Ltd, an artist management, label and entertainment business registered in Singapore.